The Roland GAIA SH-01 battery powered synth provides potent virtual analogue synthesis, yet the control panel controls are fun, friendly, and inviting, even beginning keyboard players can create great sounds. The Roland GAIA SH-01 synth uses three virtual analogue engines each with its own dedicated oscillator, filter, amplifier, envelope, and LFO to produce the tones of a vintage synth. However, there are no menus to navigate and no pages to scroll through, just analogue-style knobs and faders that drive the synth engines. The Roland GAIA synth's signal flow is simple to grasp, with logically arranged knobs, sliders, and buttons. Hands-on control and fat sound make the Roland GAIA synthesizer a joy for music students, songwriters, session players, and live performers of all styles and skill levels. The Roland GAIA SH-01 37-velocity sensitive key synthesizer features a triple-stacked virtual analogue synth engine, comprising three complete synths with 64 note polyphony for thick, powerful sound. Three oscillators drive a trio of multimode, resonant filters, multi-shape LFOs, and amplifiers, plus nine envelope generators. Layer up to five simultaneous effects for dozens of variations with the Roland GAIA synth. Onboard effects include reverb, distortion, fuzz, bit crash, flanger, phaser, pitch shifter, low boost, and delay with panning and tempo sync. Dedicated control knobs tweak the effects in real time. 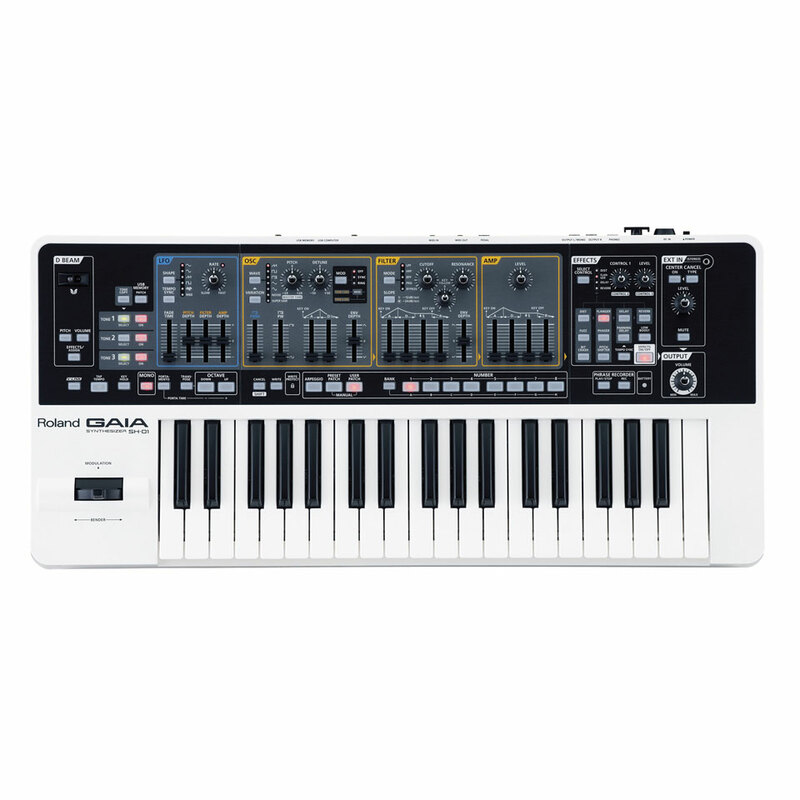 The Roland GAIA SH-01 synthesier is easy to operate with a front panel that puts every control directly under your fingertips. No hidden menus, just play and operate the knobs and sliders, or wave your hands over the invisible D Beam for dramatic effects. The front panel follows the signal path from left to right and allows hands-on control during performance. Connect the Roland GAIA SH-01 synthesizer directly to a Mac or PC via a USB cable and stream audio directly to DAW software. GAIA's USB port can also be used to transmit and receive MIDI data, and to store your patches and phrases recorded with the Phrase Recorder to a USB memory stick. An EXT input connects external audio sources such as an MP3-player to play along with songs or backing tracks. Weighing less than 10-pounds, the Roland SH-01 GAIA synthesizer is lightweight, compact, and mobile. 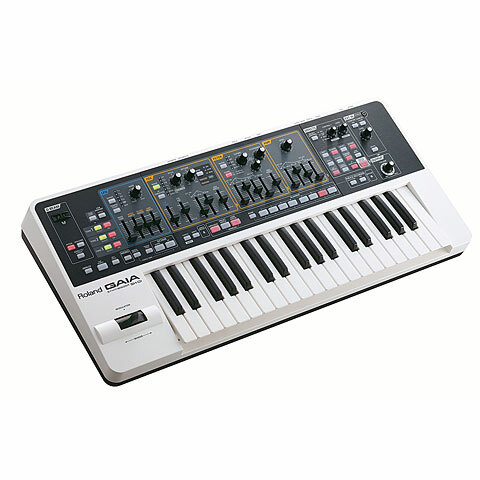 The Roland GAIA SH-01 synth can be powered via AC adapter or 8 rechargeable nickel-metal hydride AA batteries. Battery life for continuous use is approximately 5 hours. This item was given an average rating of 4.1 out of 5 stars. No review about this product has been written yet. 10 ratings exist without a text or these reviews are written in another language.